I've been a huge fan of plain text for quite some time now and I love being able to make presentations using plain text as well. I find the process much quicker to go from a text outline into a full on deck of slides using Markdown or ReStructuredText. If you have your text editor set for these, you can use text folding and all your powertools to rearrange and get your thoughts quickly down into the presentation. It really helps to separate the ideas from the presentation look-and-feel. In the past I had been using Landslide and Hovercraft to generate my slides from me into nice looking HTML 5 based presentations. They did a nice job, but really weren't "interesting" looking for the end-result unless you put a ton of time into the theme. And even then, it was still pretty vanilla. I picked up and started using Deckset about a year ago and love how easy it is to make visually interesting slides from plain ole Markdown. It comes bundled with almost 20 pre-made themes and each theme has a variety of color options. My only issue is sometimes I do want a "Six Feet Up branded" experience when giving presentations to prospects or partners, but I still want the ease and power of Deckset. It is my understanding (or wishful thinking) that future versions of Deckset will give presentation authors more control over the theme, or even the ability to create our own themes. Until then, I've found a quick workaround: you can make a background image that is your "branded" experience and use that on every slide. It is less than optimal, but I was very happy with the results. I made a PNG image that is of 1080p resolution (1920 x 1080) and put it at the top of each slide, and then made the rest of the slide. The only downside to this technique is you can't use images in slides that have the "branded" background. I'd love to lean about other plain text presentation tools. How do you author your presentations? Thanks for filling out the form! A Six Feet Up representative will be in contact with you soon. Have a technical question? Ask a Sixie! I consent to having this website store my submitted information so Six Feet Up can respond to my inquiry. 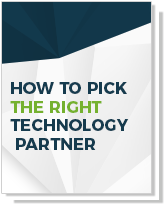 Use this free guide when interviewing technology partners to determine if they are a good fit for your next project. Get our latest posts and tips delivered to your inbox. No spam, ever. Your information will only ever be used for Six Feet Up’s monthly news.